Browse > Home / Boyle Heights, City of Los Angeles, County of Los Angeles, East Los Angeles (LA City), East Los Angeles (Unincorp. ), Eastside Sun, General News, Montebello, News, Northeast Los Angeles, Northeast Sun, South Gate, Southeast Los Angeles / Prepared for these Wet Winter Days? Prepared for these Wet Winter Days? The City and County of Los Angeles are working diligently to inform the community about the preparations that can be taken during these stormy days. Los Angeles Police Department (LAPD) is informing the L.A.’s homeless population of the pending inclement weather, in an effort to keep them safe and dry. Each geographical division of the LAPD has identified homeless encampments that are in areas subject to flooding, according to a press release sent to the media. “Officers are out on foot, advising the homeless of the possible flood danger, as well as passing out flyers with locations of available shelters and property storage options,” stated LAPD. Signs are posted, warning that heavy rain can cause floodwaters to rise, and public address systems are being utilized to ensure everyone hears the important information. LAPD informed that if the Los Angeles Fire Department determines there is a predicted or anticipated rainfall within 24 hours, a Rain Notification Tracking Form must be completed, signed by a Watch Commander and forwarded to LAPD’s Real-Time Analysis & Critical Response Division. That form includes the date, time, location and method used for all notifications. The Los Angeles area is periodically subject to floods that result in property damage. The potential for mudslides and debris flow is greatly increased near recent wildfires. 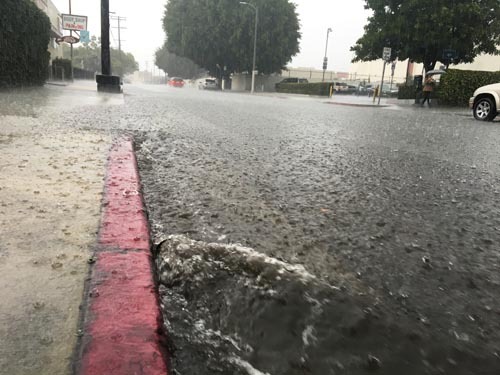 Los Angeles residents—especially those in foothill and low-lying communities, are encouraged to prepare their properties in advance of coming rainstorms. In an effort to help, the Los Angeles Fire Department (LAFD) works closely with the Department of General Services and has ordered more than 200,000 ready-to-fill sandbags, made available at all Neighborhood Fire Stations (Please note that residents are welcomed to no more than 25 bags). LAFD also works very closely with the Bureau of Street Services and has ordered more than 250 tons of sand made available at several fire stations and convenient community locations. Fire Station 2 (Boyle Heights), CD 14 Office, 2130 E. 1st St., (323) 526-9332 . It is quite normal for potholes to form during heavy rain seasons. To report any new or existing potholes call 3-1-1. January 5, 2016 Copyright © 2012 Eastern Group Publications, Inc.